A baby girl weighs 2st 10lbs due to her constant cravings for food - but is piling on even more pounds as the days go by. She now struggles to breathe and even sleep as a result of her excessive weight caused by eating like a '10-year-old', local reports suggest. Chahat also suffers from abnormally hard skin that makes taking her blood samples to analyse her condition more difficult. But the family lack the crucial funds needed to travel further afield to get advanced medical treatment. 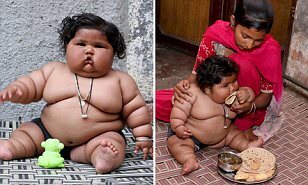 She started to put on an excessive amount of weight when she turned four months old, despite being born normal-sized.